Today is ‘Maundy Thursday’ in English and in Swedish it has the unusual name of ‘Skärtorsdag’. The word ‘skär’ means ‘pink’. But does that make today Pink Thursday?Actually not. The word ‘skär’ has another meaning that might be more relevant – ‘clean’ – and it is a biblical reference. If you know your bible stories, today being the day before Good Friday is the day when Jesus gathered his disciples together for the Last Supper, introduced communion, and was later betrayed by Judas, and condemned to death on the cross. Prior to the Last Supper, Jesus washed the feet of the disciples. And he washed them clean – a symbolic metaphor for purification and the washing away of sin. So, today isn’t Pink Thursday – it’s Clean Thursday. In fact, in English ‘Maundy Thursday’ also relates to the same act in the bible – the act of ritual cleaning is known an The Maundy. However, in Sweden, today isn’t that much about washing feet – it’s more about witchcraft! 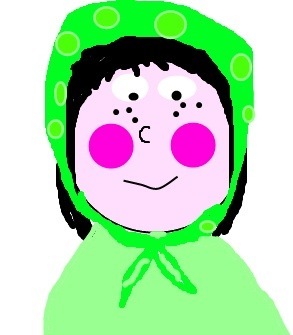 Today is celebrated by children dressing up as witches, rather like we do in the UK and USA on Halloween. Children go door to door in their outfits begging for sweets. Well, at least this is what I have heard. In the 20 years I have lived in Sweden, no witchy child has ever knocked on my door. Maybe that’s a city thing? Perhaps the tradition is more popular in the suburbs and the countryside? But why do they dress at witches in the first place? Well, this tradition originates from the belief centuries ago that the Skärtorsdag was the night of the witches, where these wicked hags would climb onto their broomsticks and fly to a mountain called Blåkulle. It was a night of danger and evil, and Swedish people would bar their doors to their houses and barns and leave outside gifts that would make the witches’ journey easier – food, milk, clothes, broomsticks. Today, that translates into the Swedish version of trick or treating. So if you celebrate by cleaning, or by dressing up as a witch or by eating candy – you’ll be kicking off your Easter the Swedish way! In Sweden, they don’t only have Christmas trees, they also have Easter trees. This Easter tree, known as ‘påskris’, is a handful of twigs and sticks (usually birch) installed in a vase with coloured feathers attached to the ends. People often hang painted eggs and other decorations such as chickens in their installation. The Easter tree can be seen all over the country at this time of year: outside shop entrances, in peoples’ living rooms, in gardens, in the middle of roundabouts. The Easter tree is an interesting cultural phenomena – but where does it originate? Wiping: Well, some Swedes say that it symbolises the wiping away of the winter. The twigs represent a broom and the feathers get caught in the broom as we sweep. Witching: Others say that it represents witchcraft. The twigs represent a witch’s broomstick and the feathers indicate flight. This could also be why Swedish kids dress up as witches at Easter and do a kind of ‘trick or treating’ for Easter eggs. Whipping: But, apparently the Easter tree has a completely different origin and symbolism. Swedish people, in the 1600’s, used to take twigs and sticks and beat each other with them on Good Friday to commemorate the suffering of Jesus. In the 1800’s and 1900’s, they started to be decorated and became a symbolic decoration for Easter. So, wiping, witching or whipping. Who would have thought the colourful Easter tree would have such a colourful history? Today, the Thursday before Easter is called ‘Skärtorsdag’ in Swedish. As the word ‘skär’ translates as a shocking pink colour, many people joke that today is ‘pink Thursday’. But the word ‘skär’ in this case relates to something else – something far more biblical. The word ‘skär’ is an early Nordic word meaning clean and pure. And here, we see a parallel to the English word for ‘Skärtorsdag’. In English, today is called ‘Maundy Thursday’ and it relates to the religious rite known as ‘the maundy’ which involved the ritualistic cleaning of feet. According to Christian belief, today was the day that Jesus performed this act until the recipients had clean and pure feet. It also is the day of the infamous Last Supper. However, in Sweden today, ‘Skärtorsdag’ is not celebrated in any great religious fashion but in a pagan manner. 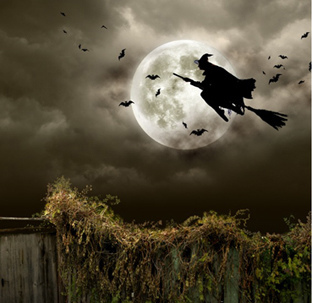 A old pagan belief in Sweden was that on this day witches would mount their broomsticks to fly away to the legendary mountain known as Blåkulla. At Blåkulla it was believed that the devil held his earthly court. There the witches celebrated their sabbath and danced with the devil. In modern day Sweden, we see this reflected in the many children who dress up as witches. These kids paint Easter cards and walk around the neighbourhood knocking on doors to wish everybody a happy Easter. In exchange, they hope to receive Easter sweets. Today is ‘Skärtorsdag’, or Maundy Thursday in English. In Sweden it’s celebrated by Children dressing up as witches. This tradition originates from the belief centuries ago that tonight was the witches night, where witches would make their journey to Blåkulle – the Blue Mountain. It was a night of danger and evil, and Swedish people would bar their doors to their houses and barns and leave outside gifts that would make the witches’ journey easier – food, milk, clothes, broomsticks. Today, Swedes give the children sweets and money. But why is it called Skärtorsdag’? The word ‘skär’ means ‘pink’. But does that make today Pink Thursday? The word ‘skär’ has Another meaning that might be more relevant – ‘clean’. If you know your bible stories, today being the day before Good Friday is the day when Jesus gathered his disciples together for the last supper, introduced communion, and was later betrayed by Judas, and condemned to death on the cross. It is the day evil was said to be released – hence the witches described earlier in this text. Prior to the last supper, according to the Easter story, Jesus washed the feet of the disciples. And he washed them clean – a symbolic metaphor for purification and the washing away of sin. So, today isn’t Pink Thursday – it’s Clean Thursday. I’d better start mopping the kitchen floor then. The word ‘skär’ has another, pre-Nordic meaning that is more relevant – ‘clean’. Prior to the last supper, Jesus washed the feet of the disciples. And he washed them clean – a symbolic metaphor for purification and the washing away of sin.